● Python 2.6, 2.7, 3.4 and 3.5 Support: PyRun works with all popular Python versions. We chose the single source approach for achieving this, but had to drop Python 2.5 support as a result. The include/pythonX.Xdirectory is only needed in case you want to compile Python C extensions. It is available as part of the prebuilt binary distributions we make available. For Python 3, the include directory has the ABI flags appended. For Python 3.4, this is include/python3.4m for most Python installations, for Python 3.5 include/python3.5m. To facilitate shipping custom external libraries with PyRun, newer versions of PyRun (2.1 and later) add an rpath setting to the binary which results in the dynamic linker on compatible systems to first look in these directories for shared libraries such as OpenSSL, SQlite, ZLib, BZip2 or LZMA (Python 3 only) libraries. or SQLite. If you want to build against a specific Python version, you can specify the version using the make parameter PYTHONFULLVERSION=2.7.5. Please have a look at the top of the PyRun/Makefile for supported Python versions. It is also possible to set the OpenSSL installation directory by passing SSL=/path/to/openssl to the make command. 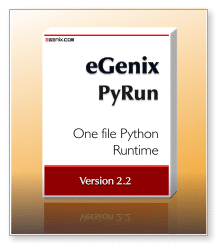 The eGenix PyRun PyRun/Makefile supports passing in parameters for CFLAGS and LDFLAGS, which are then used for building the Python interpreter and the frozen pyrun binary. Please have a look at the PyRun/Makefile for more customization options. In Python 3.4+, the Python I/O encoding is determined by looking at the locale of the process. Depending on the used system, this can be UTF-8, ASCII or some other encoding. The default for PYTHONIOENCODING in eGenix PyRun 3.4+ is "utf-8:surrogateescape". This allows pyrun to work in most situations without failing prints or weird encoding exceptions.